Projects drive change, so project managers are change agents. 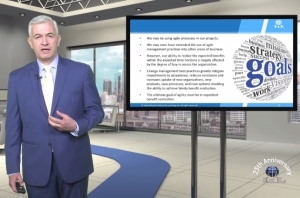 In the current swift markets and businesses, it’s crucial to head change teams with agility and embrace change. Welcome to the International Project Management Day 2016, the annual virtual conference hosted by IIL. 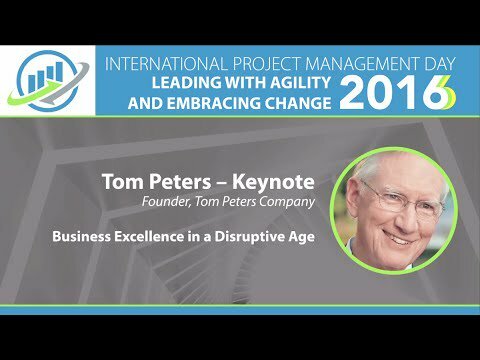 In this first part I share lessons from 3 keynote speakers, and a couple of other presentations I attended on the 25th International Project Management Day. Harold Kerzner (Ph.D. – Senior Executive Director, IIL, author of Project Management 2.0) perceives a project as the creation of sustainable value within the competing constraints. The landscape of project management is changing. Techniques like Agile and Scrum accelerated much of the changes. Today, the success of a project is measured by the benefits and value delivered rather than just time, cost, and scope. Harvesting the benefits may take months after the project is over. Project management’s impact goes up to the board room. The end-to-end investment life cycle had the project in the execution phase. The project manager can be better brought in during the Initiation phase, and have benefit realization management in place during the exploitation / run phase of the project results. The project manager can be kept on board to actually show off the value. Note the difference e.g. Managing Successful Programmes or PRINCE2 make here regarding benefits realization management. Because we had not good measurement techniques, the requirement for value wasn’t met in the past. The value was perceived as quality relative to cost. Value, however, contains more aspects. Benefits are outcomes, qualified only. Value is the quantification of benefits. There are tradeoffs and dependencies among benefits. Corporate management wants to know all about the value being created, the risks the company is facing, when to intervene, etc. The draft PMBOK 6th edition (the final version will be published end 2017) finally recognizes value and benefits management. Resource management is key to new approaches like Agile and Scrum. Kerzner uses Kaplan’s Balanced Scorecard (1996) categories of benefits. Can you measure benefits incrementally or only at the end? In Agile business value can be measured throughout the project. Business value is delivered along the lifecycle of the project. In waterfall approaches only at the end or less frequent moments value is delivered. Uncertainty about their roles and responsibilities of decision-makers. The project is approved without a business case or benefits realization plan. Uncertainty and ambiguity in benefits and value definition. A focus on deliverables instead of benefits. A Wong definition for project success. Traditional project life cycle phases instead of investment life cycle. Wrong or unreliable metrics or a lack of metrics to track benefits and value. Fail to track benefits and value over the project cycle. No criteria established when to terminate a failing project. No transformational process (ownership) where benefits and value need to be driven by management. Fail to capture and share lessons learned and best practices. Organizational changes need to be managed, the organization accommodated to the upcoming changes. Agile approaches embrace change. When change management is ignored or not implemented properly, your project could derail. If you’re not aiming for excellence, resilience, and perseverance, why bother being a project manager? Tom Peters in 1982 wrote In Search of Excellence, states boldly that the U.S. Navy invented Agile with their Can Do mentality. Note, that Jeff Sutherland explained the same sources in his Scrum: The Art of Doing Twice the Work in Half the Time. Don’t waste time, fail fast, learn as soon as possible. Your new purpose #1 is excellence. It’s a moral imperative. Leaders do people. Develop the skill set (both hard and soft skills) of all the people to do their utmost. Business has to enrich lives of both employees and customers. Excellence in project management is a / the great human achievement. Help people grow and flourish. Organizations exist to serve. Leaders live to serve. Serve others! Peters is bald, has the support of Good Business author Mihaly Csikszentmihalyi (known by the Flow concept). Talents well used are what the world makes a better place to live in. Excellence is the ultimately short term challenge. What are you doing next? Think of insanely great, wow factor, greatness, immortal that kind of attributes, rather than on time / within budget. Speed is everything, but core to good decision-making is the management of delay. Peters recommends Susan Cain‘s Quiet: the Power of Introverts in a world that can’t stop talking. I would like to add Andy Johnson’s Introvert Revolution: Leading Authentically in a World That Says You Can’t here. Open offices? Work alone, state both Tom Peters and Steve Wozniak. Close open offices, says David Burkus in Under New Management. Leave up to 50% of your time unscheduled, recommends Dov Frohman in Leadership The Hard Way. Do one thing at a time. Be aware of yourself and how you affect everyone around you. Invest in relationships. 220 lunches each year, golden opportunities for relationship development. Effective project management is political mastery! Acknowledgment is powerful. Apply these 2 words more often: Thank You. The 4 most important words in any organization are: what do you think? Women make much better executives than men. Women outscore men taking initiative and driving results. Corporate boards with more women outperform others. Women buy everything, so make them predominant in decision-making. Note, that Richard Branson spent 116 pages of his Leadership The Virgin Way on listening. Project Management can be seen as an odyssey. 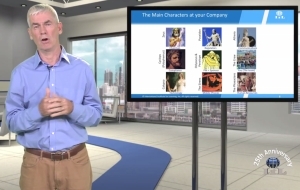 IIL trainer Frank Ryle takes the 10 year battle of Troy as a metaphor of the power of storytelling, and capture lessons learned. Use the MoSCoW method for hard choices. Consult widely before heading out. Sing to me of your project, my project manager. The project of twists and turns. Joanna Durand promoted the Enterprise Project Management Office (EPMO) to support project, program, and portfolio management. There’s more: the EPMO has a leading role in end-to-end delivery, by integrating roadmaps and plans, cross-program interdependencies management, advocating solution design approach and aligning company-wide strategies. Sponsor onboarding is another key activity in this EPMO Lead pillar. The Engage pillar is about maintaining a CoE for program delivery and business requirements for consistency in key delivery areas. Delivery assurance reviews are done, and a consistent set of project delivery roles and responsibilities is established. Durand shared how the EPMO can support the enterprise through an agile rollout. 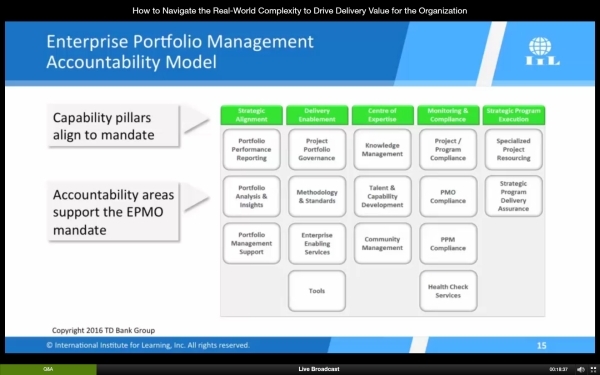 An EPMO plays a role in building overall PMO maturity. Her keynote served as a teaser to introduce the playing field, and practices. Read more on different types of EPMOs on PinnacleManagement.com.